Erie Land Light – Jenny and Jonathan Got Married! 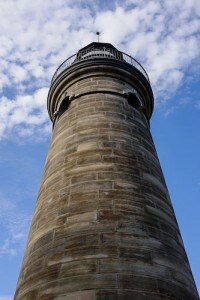 On a recent visit to Erie, we ventured over to the Erie Land Light. This lighthouse has a pretty interesting history. The lighthouse holds the distinction of being the first known lighthouse on the Great Lakes (shared by the Buffalo Lighthouse), and I believe the current structure is one of the oldest remaining lighthouse structures on the Lakes. This is actually the third incarnation of this lighthouse. The first, a stone tower 20 feet tall and a wood frame keeper’s house built in 1818, began to sink into the unstable soil, and by 1857 had to be replaced. The second incarnation included a new keeper’s house and a tower 56 feet tall, and was completed in 1858. Less than ten years later, that tower was also failing due to unstable soil conditions, and was dismantled in 1866. 1867 saw the construction of a massive foundation about 200 feet away from the original, set back a little ways from the bluff overlooking the bay. Upon this foundation of oak beams, crushed stone, and portland cement, the current 49 foot tower was constructed. A short time later, the keeper’s house was expanded to include a second story. In 1858, the Presque Isle Light was constructed near where it stands today at the end of the North Pier (that light has interesting history, too, being made of iron cast in France and shipped here, replacing the original wooden structure that was destroyed by an errant schooner during a storm in 1857, and is the only lighthouse of its kind in the United States). 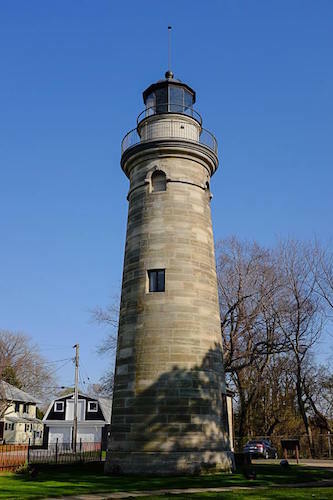 The lighthouse board decided that only one light was needed, and decided to close the Erie Land Lighthouse in 1880, selling the property shortly after to the owner of the surrounding land. The lamp, lens, iron staircase, and some other parts were removed ad placed in storage in Buffalo. Mariners protested the closing of the light, and in 1884 the lighthouse was repurchased. After reinstalling the items removed and rebuilding a few items that were lost, the light was activated again in 1885. In 1899, the lighthouse was permanently deactivated, and its lamproom and lamp were sent to Marblehead Lighthouse in Ohio. They are still there today. The lamphouse on top of the Erie Land Light now is a faithful reproduction of the original, using stone from the same quarry as the original. It was completed in 2004 as part of a grant to restore the lighthouse and keeper’s house. The lighthouse and the land around it is owned by the City of Erie and is used as a park. 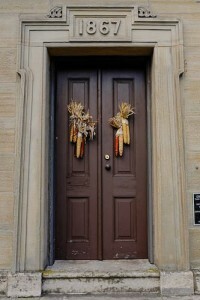 The keeper’s house is rented to caretakers who oversee the property. The lighthouse was ceremoniously relit in 1999.Oddly, unlike other lights in similar circumstances, this one doesn’t seem to appear on the charts as a private aid to navigation (see last photo–the light stands just to the west of Lighthouse Street along the bluff). I’m not sure why that is, though there are several other beacons in the area, and perhaps the current light in the tower does not have good visibility on the lake. 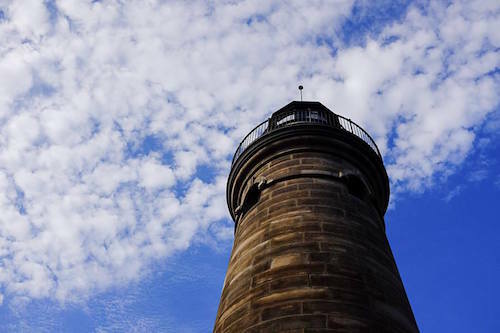 If you are in Erie and have a chance to visit the Erie Land Light, it’s worth the short drive from Presque Isle. 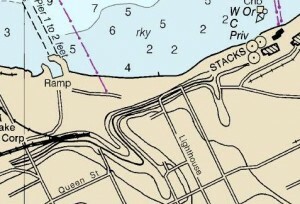 Punch 16 Lighthouse St., Erie, PA into your favorite GPS or mapping program, and it’ll take you to the right place. 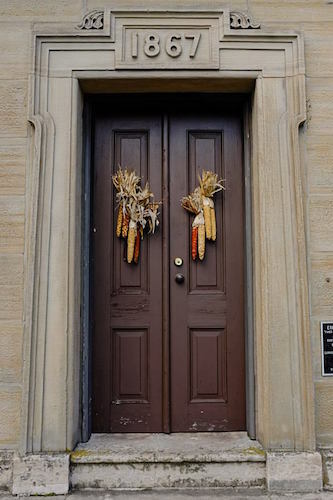 If you have the option, ride the Bayfront Parkway along the bay to look in on some neat maritime stuff, including an active shipbuilding company, the Commodore Perry Yacht Club, the Erie Maritime Museum, and more.